The Text Interface has the most common user interface elements including a keypad interface, a text LCD interface, a rotary encoder with center button, LEDs, and a simple tone generator. 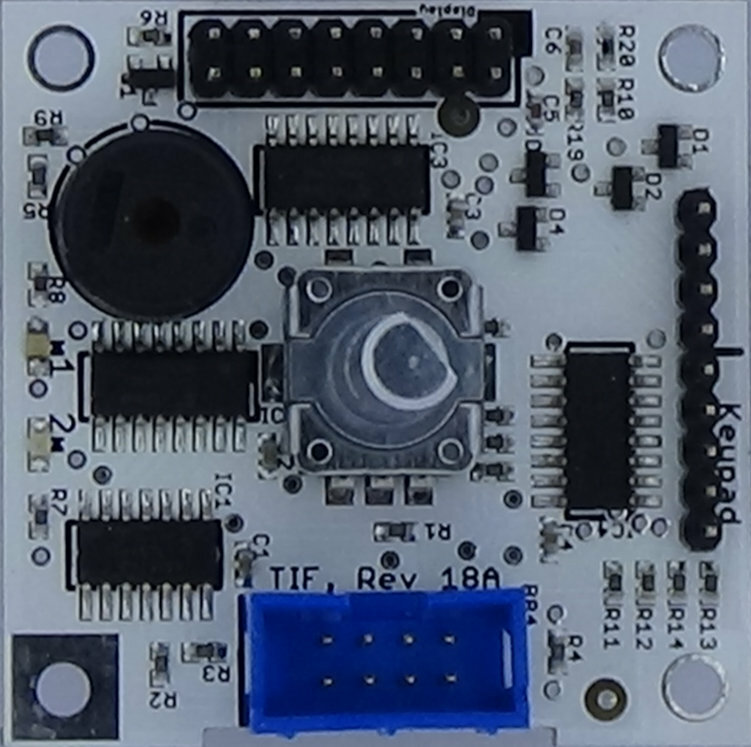 The Text Interface Card has a rotary encoder with center button, a piezo speaker, two user controlled LEDs, a 4x5 keypad interface, and an interface to a text LCD display. More information about the TIF cards is available here cards/tif.html. keypad : the state of the keypad. encoder : rotary encoder and center button status. The count is positive for clockwise rotation and negative for counter-clockwise rotation. The count is incremental and report just the change sine the last report. To get a position from the rotary encoder you will need to sum the counts as they come in. There are 96 counts per full rotation. This resource works with dpget and dpcat. Note that the encoder is mechanical and turning the knob too quickly might not allow the contacts to close. This will appear as missing counts. Pressing the center button on the encoder give a button value of 1. A zero indicates that it is open. tonegen : tone to play on the speaker. Tonegen is a write-only resource that works with dpset. leds : the state of the LEDs. The state of the LEDs is a hex value between 0 and 7. Bit 0 controls the LCD backlight. Bit 1 controls User LED #1, and Bit 2 controls User LED #2. A set bit turns the LED on. text : characters to display on text LCD. commands : comamnds sent to the text LCD. script or at the Bash promot. dpset tif text "Robot Ready!    " Turn on the LCD backlight, sound a beep, and then start monitoring the keypad.